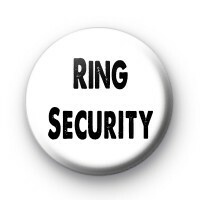 This ring security badge is designed for ring bearers & children at weddings. A bit of fun to get kids involved in the wedding & have them guard the wedding rings. Standard 25mm badge made in our UK workshop. A white 25mm badge with black ring security text. Perfect for ushers, page boys and even the best man. We have a great selection of badges for weddings & they make great little keepsakes for your big day. Have a look at the rest of our wedding badge range in the wedding button badge category.